This technical rendition of Atlantis docked to the Kristall module of the Russian Mir Space Station shows the largest space platform ever assembled, which was completed June of 1995. 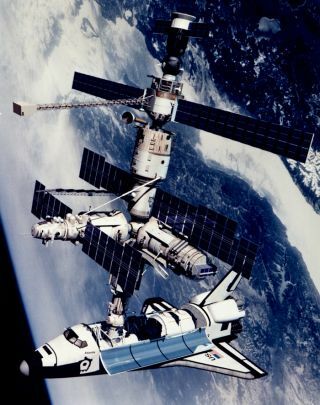 In this historical photo from the U.S. space agency, a technical rendition of the Space Shuttle Atlantis docked to the Kristall module of the Russian Mir Space Station is displayed. The configuration shown is that of STS-71/Mir Expedition 18, a joint U.S. Russian mission completed in June 1995. The Space Shuttle/Mir combination, which was the largest space platform ever assembled, is shown overflying the Lake Baikal region of Russia. The Space Shuttle Atlantis appears in a new configuration for the STS-71 flight. The Russian developed Androgynous Peripheral Docking System (APDS) is used to link the Orbiter to the Kristall module. The APDS is mounted atop the U.S. developed external airlock that connects to a modified tunnel section leading to the Spacelab module in the far aft of the payload bay. Mir is shown in its 6 module configuration. The Kristall module has rotated to the forward docking port of the Mir Base Block to facilitate the docking of the Space Shuttle. The Priroda module is shown extending over the port wing of the Orbiter with its solar panel in the retracted position required by the dynamics of Orbiter/Mir docking. The Kvant 2 airlock module appears parallel to the Orbiter crew module, while the Spektr module is at the nadir and is hidden from view by the port solar panel of the Mir Base Block. The Kvant module is shown at the aft of the Mir Base Block with the solar panels of the Kristall module installed and fully extended. The Soyuz TM transport vehicle used for the launch and docking of the Mir Expedition 18 crew is docked to Kvant.